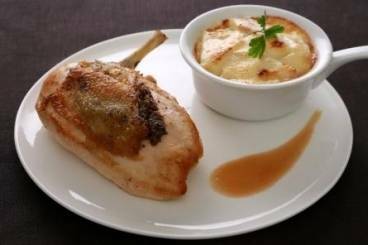 Chicken breast stuffed with mushroom and truffle puree and served with a gratin of celeriac, potato and parmesan. Take a chicken breast and gently lift the skin from the meat. Add a spoonful of the tartufa mixture and press the skin back down, spreading out the tartufa. Heat a frying pan and add a drizzle of olive oil. Add the chicken to the pan, skin side down and cook until golden brown. Turn over and cook for 1 minute on the other side. Place on to a baking sheet and cook in the oven for 10 minutes. Remove from the oven, season and keep warm. If you have any chicken bones, colour them in the same pan used to cook the breast. Add the bouquet garni and the onion and sweat for a few minutes. Deglaze the pan with the white wine and allow to reduce completely before adding the chicken glaze. Simmer for 25 minutes and then pass through a sieve. Return the liquid to the pan and reduce to a jus. When ready to serve, whisk in the butter, making sure the pan is off the heat. Peel the potatoes. Cut the celeriac into quarters and then each one in half again and remove the skin. Use a mandolin to cut the potatoes and the celeriac into 3mm slices. Add the potatoes and the celeriac to a saucepan, along with the cream and a little water. Add the salt, cover, bring to the boil and cook for 15 minutes. Transfer the vegetables to individual cocottes, leaving the cream in the pan. Bring the cream back to the boil and reduce by half. Pour the cream into the cocottes and top each one with parmesan. Place the cocottes in the oven and cook for 10 minutes. Check that the vegetables are cooked and the cheese is golden brown. Serve the gratins alongside the chicken and finish with a smear of the sauce.